If you’re just hearing about my international Reader Appreciation Giveaway for the first time, don’t worry! It’s not even halfway over yet. We’ve had two our of the four weekly drawings, whose winners have chosen a signed copy of Skylark and a signed copy of Lark Ascending, and the grand prize (a package of ALL the above books, including the advance reader copy of This Shattered World) is still open. Winners for that will be drawn at the very end of the month. Remember that while newsletter subscriptions still count for the most entry points, you can reblog the original post and the tweet linked there up to once a day, and each signal-boost increases your odds. Both winners so far were newsletter subscribers that were also signal-boosting! Hi guys! Though I don’t do a regular roundup (I wish I had the energy/time for that, because I love them!) there are enough contests and freebie promotions for my books floating around that I wanted to put them all in one place for you. That way, you can just click through them all and enter! 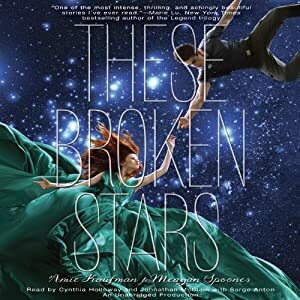 Monday begins the official blog tour for THESE BROKEN STARS, so blog posts, tweets, and other social media will be flying every which way. I wanted to give you guys a heads up before all that starts! Howdy, all! Now that SHADOWLARK is out in the world, I’ve decided to take a page from Jodi Meadows‘ book and spend some time thanking and encouraging the awesome people who review books. Online reviews are vitally important–they help books stand out in an incredibly crowded market, and they help other readers find books they think they’d like. 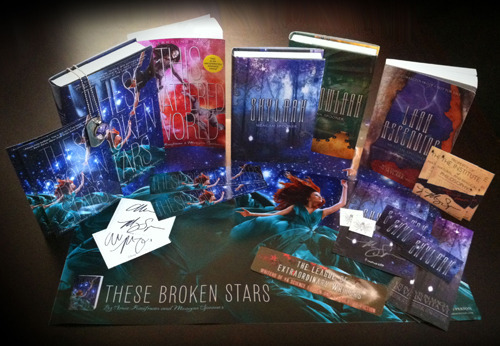 For the next month, anyone who reviews SHADOWLARK on a booksellers’ page will be entered to win the signed Skylark book of their choice OR a pre-order of THESE BROKEN STARS! And everyone* who participates will receive some Skylark and Starbound swaggy goodness in the mail. How’s that for a deal? Signed bookmarks, postcards, tattoos, the works! The grand prize is absolutely open internationally, but only US residents will get the swag in the mail for reviewing. International postage is insane, y’all! I’m accepting four different booksellers in this contest: Amazon, Barnes & Noble, Book Depository, and Books a Million. You can enter the contest by reviewing on only one of these sites, but each additional site you hit increases your odds of winning! You may use the same review on every single site, just copy/pasted. No need to write four different reviews. Each review must be at least 100 words. This is just to stop one-sentence spam entries. For reference, the first two paragraphs of this blog post are more than 100 words. Please note that you can say whatever you truly feel about the book! I will not take the content of the review itself into consideration when choosing a winner–the winner will be chosen by random drawing. I’m not asking for glowing raves–only honest opinions can help other readers decide whether they want to give a book a try! * I’ve set aside a chunk of fun stuff to send out, and everyone who enters will get some in the mail until I run out. I’m not anticipating running out, but you never know! So move quickly! SHADOWLARK blog tour starts TODAY! Hey, team! The SHADOWLARK blog tour, arranged by the lovely Jessica at Step Into Fiction, starts todaaaay! What does that mean? Well, every weekday (and one Saturday!) for the next two weeks there’ll be another peek at the sequel to SKYLARK, through interviews, guest posts, reviews, and sneak peeks. And in each and every post, you’ll have a chance to win a book. On top of those individual chances, there’s a grand prize which you can enter for by visiting each of the posts during the tour, scavenger-hunt style.